During Monday night's Emmy Awards, Bill Hader won the award for Lead Actor in a Comedy Series and hugged a strange man sitting in front of him. 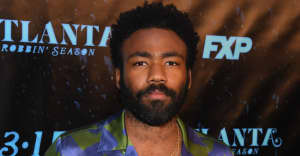 That man was sitting with the cast of Atlanta and appears to be Donald Glover dressed as Atlanta character Teddy Perkins. In the show's second season, Glover played the eccentric white villain who tries to trap Darius in his mansion. Minutes later, Glover reappeared as his normal self (or maybe Perkins was just a stand-in for him...) A rep for Glover was not immediately available for comment. Check out some tweets Glover's disguise below.